I remember I once had a pair of mini speakers for my desktop computer. One speaker had a line input and an integrated amplifier and connected to the other speaker with a thin speaker cable. That was in the days before I realised it was possible to get good sound out of a computer. Epoz, the appositely named Australian offspring of the Creek/Epos organisation, have taken this concept and boosted it into a full sized stereo system, including FM and Internet radio over wi-fi and lacking only a main music source. External sources are taken care of by a concealed iPod dock on the top of the speaker, along with phono and mini jack inputs to allow connection of conventional sources as well as a USB input for music on memory stck. It's even possible to stream wirelessly from a PC. Taken together the system offers more than a normal iPod docking station and has some hi-fi potential given its antecedents, so I thought it worth a look. 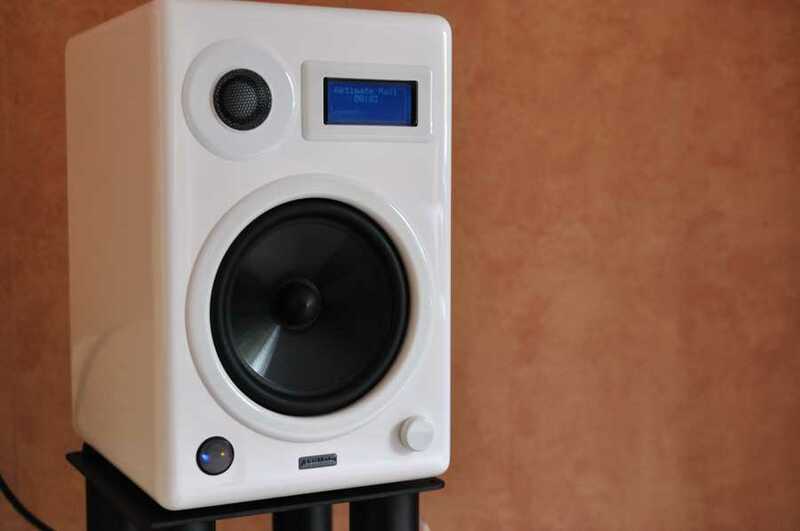 The basis is a pair of two way 4ohm bookshelf speakers designed by Epos. The mid/bass woofer is a six and a half inch polypropylene cone paired with a one inch metal tweeter. The speakers are a rear ported design giving a claimed bass extension of 48hz. There is no grille for the woofer but the tweeter is protected with a non removable metal mesh. The 60W amplifier is in the left speaker. It is a Class A/B unit designed by Creek, based around a National Semiconductor LM4780 Overture chip and powered via a torroidal transformer. It connects - using a conventional speaker cable - to the passive right speaker. A basic speaker cable is supplied but it would probably benefit from using something a bit chunkier (maybe one of TNT's cat 5 designs). Being used to speakers both looking the same it is surprising to see the left speaker also having a remote sensor, a control button and a small LCD screen. 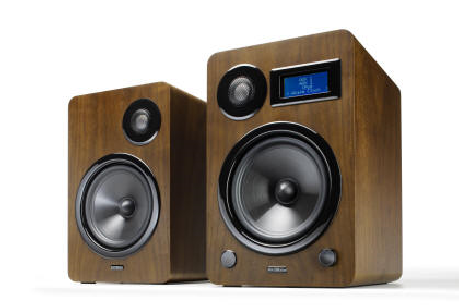 It is marketed as an active system but these are not fully active speakers. Active speakers generally benefit from one amplifier per driver or at least one per cabinet. These have a single amplifier built into one cabinet which feeds the other. They are fairly big for standmounts and too big to use as desktop PC speakers (unless you have a very big desk!). First impressions are very good. The speakers are sturdy and the finish excellent. Set up was fairly straightforward. I positioned them in my study, which is about 20 meters and two doors away from my Wi-Fi hub. Nevertheless the receiver locked onto the signal without difficulty and once the access code had been input (a rather clunky process) tuned itself onto internet radio stations with any issues. I set it up to play BBC Radio and connected a netbook via my little HotAudio USB DAC to see how it fared with other source material. And the result was pretty pleasing. Sound from the internet radio was clear and accurate - very similar to DAB. The system does include an integrated FM tuner and a basic wire antenna but my reception is not great so I didn't bother with it. The sound in my study (around 5m x 3.5m) was immediately impressive. Natural, quite warm but not coloured. I played a range of classical, rock and singer songwriter material and it coped well with everything. The bass was surprising - clean and powerful. The specification shows it goes down to 48hz and although the loss at that frequency is not specified it sounded as though this could well be the -3 db point rather than an optimistic measurement of the faintest bass frequencies which can sometimes be the case where this parameter is not specified. Mid range was open and clear and treble was smooth and unfatiguing. I was impressed enough with it after a couple of days use for background listening that I thought I'd give it a try in my main listening room. Moved into main room and pushed harder the limitations of the system started to show. It needed full volume on some tracks to fill the room with sound. Higher volumes brought poorer sound. As an example, the SACD of Sharon Bezaly playing the Mozart flute concertos exhibited a harsh edge to strings and even on louder flute passages. On rockier material, such as the Hard Candy album by Counting Crows, vocals were fine but the backing sounded mushy and drums lacked impact. I suspect that what I was hearing was amplifier disortion when the system was working to the limits of its capacity. On quieter material the sound held up even in the larger space. Playing Ryan Adams Heartbreaker album I was surprised by the big bass drum sound on the track Amy. Generally the system maintained a stable stereo image with good sense of scale. Vocals were well handled - prominent and clearly central but the speakers lacked the ability to project a three dimensional sound stage that is the hallmark of the best smaller speakers. Ergonomics were sometimes a bit challenging. The remote is pretty critical to the operation of the system, particularly given its complexity, and it is too small and basic. The buttons are tiny and their marking even smaller whilst the control logic relies on multiple button presses to scroll between functions which is cumbersome at best. The LCD screen offers information about function and radio station but I could not read it across the main room in daylight. It's probably something one would get used to, and the display would not be an issue in a smaller space but I do feel that it could have been done better, espcially since this is not really a budget unit. Finally it seemed strange given the otherwise extensive capabilities of the Aktimate that the USB input is for use with a USB stick or other memory device a but does not offer USB input for a PC. Given the target market's likely reliance on laptops for music storage and replay then it seems a wasted opportunity to improve their experience. It was also a shame that it was not possible to connect an external amplifier since this may have improved the performance at a higher volume and offered a potential upgrade path - but there is no direct access to the speakers - only via the integral amplifier. What we have is not a giant killer but it is a pretty good package. As an iPod dock it's undoubtedly very capable and sounds good in a smaller space. It could be ideal for a student as it would fill a typical student bedroom with clear, dynamic sound. And, with the exception that it lacks conventional DAC capability, it offers a good range of connectivity. Overall then a good, compact package. In my view it was rather expensive when it was first launched at £600, but it offers better value at the price for which it is now typically available. (£400).